Interested in camping in style? 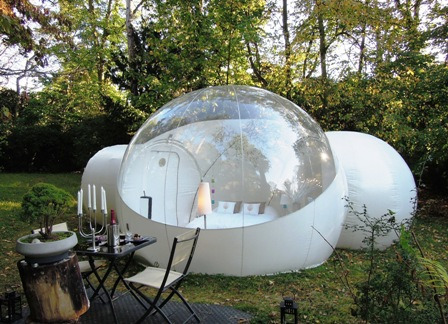 I'd have to rate these BubbleTree tents, created by French designer Pierre Stephane Dumas, as pure positive Feng Shui. The circular shape with no sharp corners permits chi to flow to every square foot of the portable, inflatable structure. They isolate you from the elements in the way a typical tent can't, yet give you an up-close-and-personal view of nature. 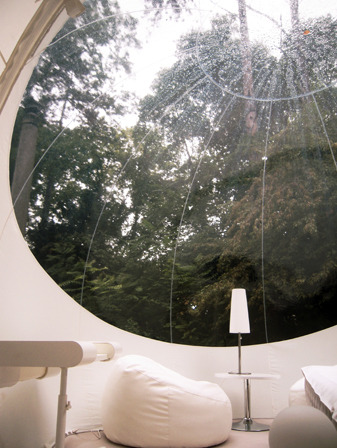 The BubbleLodge includes a second, smaller bedroom for the kids or as a sitting and dining area or reading room. BubbleTree also provides electricity and hardwood floor options for more permanent, albeit small, living arrangements. Taking time to appreciate nature can help fight depression, boost your immune system, and help you to relax. These BubbleTree tents make it easy to do so, without a lot of the hassles of camping in a regular tent, while putting you closer to nature than camping in an RV. I don't know if I'd invest in a BubbleTree, but I wouldn't mind spending a weekend away in one! You can do the same, since a number of retreats in France offer BubbleTree accommodations. If the price tag is too hefty, consider a conventional camping retreat, or just enjoy dinner on your back patio -- or your city rooftop -- to take time to appreciate the spring.